This is Athena, a Eurasian Eagle Owl. I met her ﻿over the holidays when Hil, Lily and I visited the San Francisco Zoo. 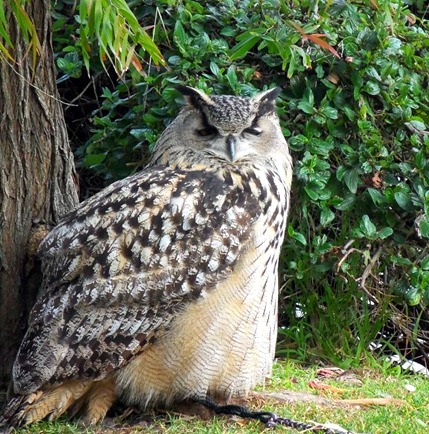 She is from Austria and was smuggled in to this country back in 2005 by a man who dyed 12 Eurasian Owl eggs to look like Easter eggs in order to get them past customs. It didn't work and the man went to Federal prison. Only three of the owlets survived, and Athena is one of them. She is huge and absolutely beautiful. I can't explain why I am so drawn to owls, but I do know that it started over a decade ago when I used to see Great Horned Owls in the treetops on hikes near my home, which I wrote about here. My obsession hasn't diminished over the years, and the recent popularity of owls is definitely helping to feed it. 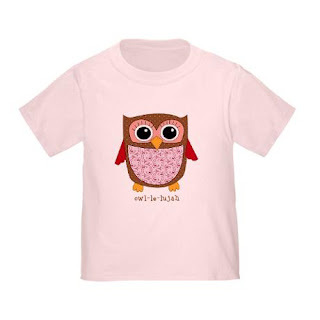 I love buying my niece Lily owl-themed toys and clothes, like this cute little shirt I just ordered for her from Cafe Press. I really am still knitting and will write about that soon. I love owls too. Great photo! I don't trust people who don't like owls. They are such beautiful creatures. The t-shirt is so cute! I saw a cute card on Pinterest the other day - two owls and underneath "Owl always love you". My mother-in-law has all these old owls from the 1970's in a collection of hers. I covet them regularly. Oh my, your story of the eggs made my jaw drop! What was this man thinking? I am thankful at least three of the eggs survived! So, what is on your needles these days? Athena is gorgeous! She looks so soft and fluffy! Oh Stacy, she is majestic, I adore owls too. Beautiful OwL:) He looks SO soft! Have a blessed day my friend, HUGS! She is quite regal! 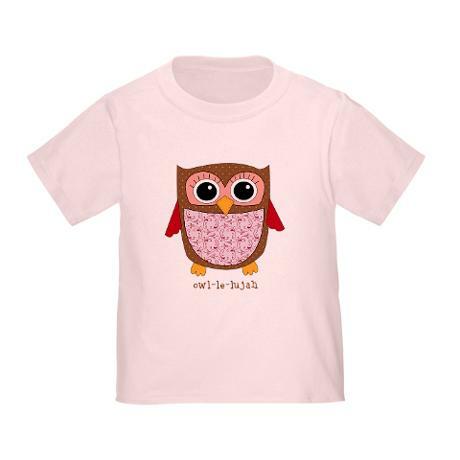 Yes, you are in owl paradise if you like buying cute owl things! Oooooh, she's a beauty! Hubby said he heard an owl outside the other night. He's now been informed that if he hears is again and doesn't call me he's going to be abused LOL.